Space Shuttle Discovery is scheduled to roll out to Launch Pad 39A from the Vehicle Assembly Building at 8 p.m. tonight - January 31st. The launch of Discovery - STS 133 - to the International Space Station (ISS) is currently slated for February 24th. The cracks in the External Tank (ET) have been repaired and the underlying reason why they occurred has been determined. Also, a mission crewmember who broke his hip in a bicycle accident has been replaced. You might of heard or read in the news about "Farthest Galaxy Discovered" this past week. Well, the headlines are not totally accurate as the OBJECT detected by the Hubble Space Telescope (HST) MAY be a galaxy, but it is currently an 80% chance that it is. HST took a 40 hour exposure with the newly installed Wide Field Camera 3 and analysis of the resulting image led to the detection of a possible primordial galaxy candidate that is 13.2 BILLION light years from Earth - the figure is an enlargement of the galaxy candidate. If this IS a galaxy, it is present only 500 million years after the Big Bang - the event that evidence shows created the Universe. This would be a big find indeed as it would show us what the Universe looked like at 4% of its estimated age. Sadly, today marks the 25th anniversary of the Challenger accident - see my 1-27-11 post. And there are only 3 space shuttle missions left before the program retires. Today (January 27) is the day NASA and the Nation pause to remember the crews of Apollo 1, Challenger and Columbia. All of them (17 total) died from accidents involving manned spaceflight. With billions of galaxies populating the Universe it was interesting to come across http://firstgalaxies.org/about-us. This is a top notch site to learn about and stay abreast of all things regarding the first galaxies formed - or put another way - the oldest and farthest from us. 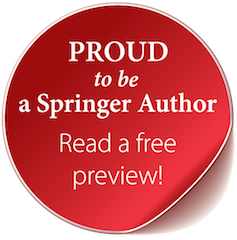 The site has great background material and the very latest in research and publications. The content can get technical but it is still worth purusing. I have it on my "Dailes". Check out the UNREAL photos of Phobos, one of Mars' two moons. There is some speculation that Phobos and Mars' other moon, Diemos, are captured asteroids. They have very dark surfaces and are very small compared to typical "spherical" moons such as our own Moon. I hope the Russians are successful in their upcoming launch and mission to Phobos. Well, we are 1 month into winter with 2 months to go to Spring. Have you noticed that the hours of daylight ARE getting longer. By the end of January sunset will be at 5:30 pm and by the end of February sunset is at 6 pm. We are gaining a minute or more of daylight a day. To follow up on my blog yesterday 1-17-11, the Sun, which powers Earth's climate by the amount of energy it transfers to the surface, seas and atmosphere, has to be monitored for intrinsic changes. These changes then must be studied to see what, if any influence the Sun has on climate change. Our ability to monitor the Sun and detect these changes has been greatly improved and is detailed in a press release by the American Geophysical Union (AGU). AGU states, "Scientists have taken a major step toward accurately determining the amount of energy that the sun provides to Earth, and how variations in that energy may contribute to climate change. In a new study of laboratory and satellite data, researchers report a lower value of that energy, known as total solar irradiance, than previously measured and demonstrate that the satellite instrument that made the measurement—which has a new optical design and was calibrated in a new way—has significantly improved the accuracy and consistency of such measurements." The bottom line as a result of the study of these solar measurements is that "(the Sun) is likely not the main cause of global warming in the past three decades." It is more data to add to the puzzle of our planet's climate. I think it is safe to say that the Earth's global temperature has increased. But the reason why is at the center of debate and ongoing research. You can measure the temperature of the oceans, land masses, atmosphere and the amount a glacial and Arctic ice lost each year. Then notice an increasing upward trend and finally try to figure out why it is happening. And perhaps, what if anything can be done about it and the affect on the planet. Data from NASA and NOAA goes a long way in providing proof from two different verifiable and reliable scientific sources of global warming. But the why, how and what it does the data mean has a ways to go before possible answers develop. Here is the latest from NASA on getting Discovery launched to the International Space Station (ISS). Discovery is targeted to launch at 4:50 p.m. EST on Thursday, Feb. 24, for its mission to the International Space Station. As stated by NASA, "In NASA Kennedy Space Center's Vehicle Assembly Building, technicians will continue installing additional support structures, called radius blocks, to space shuttle Discovery's external fuel tank's support beams known as "stringers" through the weekend. The radius blocks are being added to 94 stringers, meaning the entire circumference of the external tank will be strengthened by the time all the repairs and modifications are finished. Teams will be off Monday, Jan. 17, in observance of the Martin Luther King Jr. holiday. At NASA's Johnson Space Center, STS-133 crew will conduct an integrated simulation of the mission's first spacewalk in the fixed based simulator today. As 2010 was coming to a close, interesting things were happening concerning the Sun. 25 comets did nose dives into the Sun during Dec. 13th to 22nd. These cometary kamikazes were observed by SOHO - the Solar and Heliospheric Observatory (SOHO). It is fairly common for SOHO to spot a sundiving comet every few days but this "storm" of sundivers was unusual due to the numbers involved. The comets were thought to be in the 10-meter size and this is small as comets go. But, and this is the part that excites me, there has to be big sungrazer comets out there that could be so large and bright that they could be seen in daylight! The last such comet was Ikeya-Seki in 1965. This was before I was interested in astronomy so I never saw it. I would sure like to see one now! Holy Cow! Anti-Matter From T-Storms! You gotta' love Mother Nature! Just when you think we have seen it all as far as Earth's weather goes, a NASA space telescope designed to hunt down high energy events finds such events in our weather! Anti-matter, from thunderstorms?? Are you kidding me???? Obviously not as NASA's Fermi Gamma-ray Space Telescope has spotted beams of antimatter produced above thunderstorms on Earth, a phenomenon never seen before. It appears to be a fairly common occurrence as well, happening about 500 times a day! No matter where you are tonight and tomorrow night (1-9 and 10 )take a look at bright Jupiter and the waxing crescent Moon in the west. The celestial duo will be a beautiful sight especially in the deepening dark after sunset. If you have binoculars be sure to look at Jupiter as you can see the four main moons as tiny points of light stretching out to both sides of brilliant Jupiter. The moons change their position constantly so their number can vary as to visibility. You have to hold your binoculars steady - propping them against something solid can help. The Moon offers a wealth of detail to biocular viewers. Craters abound and the view along the terminator -the line between day and night - is a real treat to explore. Watching the position of the Moon change relative to Jupiter from hour to hour and night to night lends a 3D effect to the sky scene. You can also try taking pictures by putting your camera on a tripod and take time exposures of 1 second. You know the Moon is my favorite place in the whole Universe. I am always looking for news about our companion in space and came across a GREAT article that I want to share with you. Using Apollo era data from the Apollo Seismograph instruments left behind on the lunar surface and modern research techniques a a team of scientists has found the Moon has an Earth like core. Quoting NASA's Press Release, "The team’s findings suggest the Moon possesses a solid, iron-rich inner core with a radius of nearly 150 miles and a fluid, primarily liquid-iron outer core with a radius of roughly 205 miles. Where it differs from Earth is a partially molten boundary layer around the core estimated to have a radius of nearly 300 miles. The research indicates the core contains a small percentage of light elements such as sulfur, echoing new seismology research on Earth that suggests the presence of light elements -- such as sulfur and oxygen -- in a layer around our own core." Another BIG result of this research is that the lunar core provides evidence that supports the theory on how the Moon was formed - impact between Earth and a Mars size object billions of years ago. NASA has future lunar missions slated to further study our Moon. NASA that "the Gravity Recovery and Interior Laboratory, or GRAIL, is a NASA Discovery-class mission set to launch this year. The mission consists of twin spacecraft that will enter tandem orbits around the Moon for several months to measure the gravity field in unprecedented detail. The mission also will answer longstanding questions about Earth’s moon and provide scientists a better understanding of the satellite from crust to core, revealing subsurface structures and, indirectly, its thermal history." The farthest thing you can see in the night sky with just your eyes is the Andromeda Galaxy - a great spiral that is larger than our own Milky Way Galaxy. The Andromeda Galaxy is 2.5 million light years distant, which means the light we see today left the galaxy 2.5million years ago. 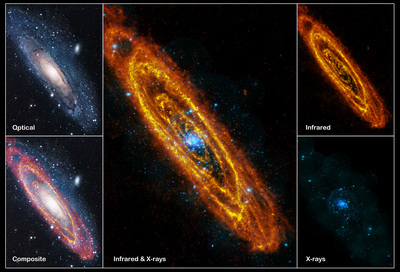 The most detailed image to date of Andromeda Galaxy was obtained by combining images from different wavelengths of light. Each wavelength gives a different perspective as to the processes going on within the galaxy. For instance, infrared details the dust that lies within the spiral arms of the galaxy and x-ray shows high energy sources at work in the core of the galaxy. By the way, in 5 billion years the Milky Way and Andromeda will merge and new galactic forms will take place. But that is another blog. If you saw my 1-3-11 blog (with photo) of Opportunity then you will appreciate this high resolution photo taken of the Rover by Mars Reconnaissance Orbiter (MRO) on New Year's Eve 2010. Such photo comparisons are valuable for figuring out exact positions and relationships in terrain features as well as pinpointing where the Rover is. Hear about the 10-year-old girl who, with her father, discovered a supernova - an exploding massive star? She is the youngest person in history to make a supernova discovery. Opportunity and her twin (and stuck) rover Spirit mark their 7th year on Mars this week - not bad considering their original mission length was 90days! We can see detail in the layers of the crater which acts like a time machine to look deeper into the history of the Red Planet. I ALWAYS love the colored pics from Mars as the planet is so alien and beautiful. Were you fortunate enough to get a new telescope this year? Or do you already have one and do not know how to use it? Happy 2011 everybody! 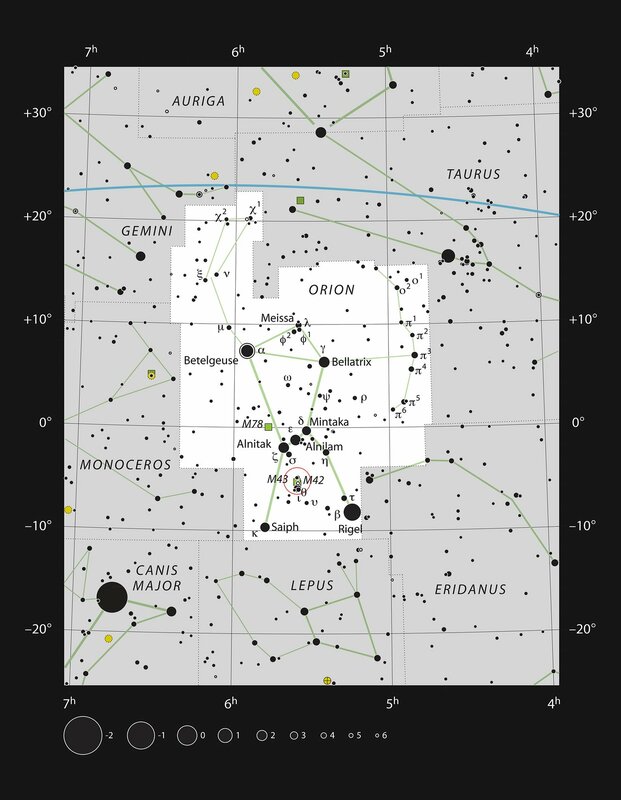 We start the new year with planets aplenty visible in the morning and evening skies. But first, be sure to join me and other astronomers at George Mason University (GMU) Observatory this year during our public observing sessions. The schedule is being established and GMU will have a new 32-inch telescope to “wow” you in the near future. I’ll post the link as soon as it is available. The Earth reaches its closest approach to the Sun, or perihelion, for the year on January 3rd. We will be 91,407,000 miles from the Sun or 1.7% less than average. Mercury provides an excellent opportunity to be easily seen, relatively speaking for Mercury, during the first two weeks of January. Mercury rises in the eastern sky almost two hours before dawn, making it well up an hour before dawn. To see Mercury, find a clear southeastern horizon and look for a golden-yellow “star”about a fist-width above th horizon starting at 6:30 a.m. On the 2nd, the thin crescent Moon will be just below Mercury. Brilliant Venus continues to grace the dark morning sky in the southeast rising almost 4 hours before dawn as the month begins. On the 29th and 30th the Moon passes to the lower left of Venus. As the month progresses Venus will be getting lower to the horizon. Bright Jupiter is well up in the south at sunset and remains visible until about 11 p.m. as the month begins but sets by 9:30 p.m. by month’s end. The Moon passes to the right of Jupiter on the 9th and 10th. If you have binoculars or a telescope you can watch the four main moons of Jupiter change their position night after night. Saturn rises in the eastern sky at 12:30 a.m. on New Year’s Day and at 10:30 p.m. by month’s end. The Moon passes below Saturn on the 25th. If you have a telescope be sure to check out the ringed planet as a large storm half the size of our entire planet is taking place high in Saturn’s clouds and should be visible in amateur telescopes – see my 12-28-10 blog. New Moon is on the 4th, First Quarter Moon is on the 12th and this month’s Full Moon occurs on the 19th. This month’s Full Moon is called the “Full Wolf Moon” in recognition of the packs of wolves that hunt during the winter months. Last Quarter Moon is on the 26th. The Northern Virginia Astronomy Club (NOVAC) will meet at 7 p.m. at George Mason University (GMU) on the 9th. The speaker is Gary Hand and he will be speaking on the topic of consumer optics. Read More About It: http://www.novac.com/meetings. The TriState Astronomers General Meeting will be held on the 19th, 7:30 p.m. to 9:30 p.m., at the William Brish Planetarium, Commonwealth Ave, Hagerstown, MD.